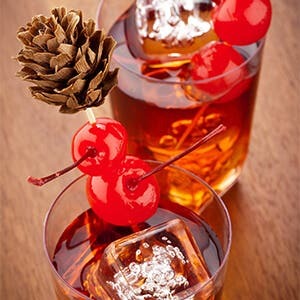 No matter what season, every party needs to be garnished with great cocktails. Having unique drinks that complement your food perfectly will surely stand out to every guest. This warm and delicious drink counters cold nights. With just the right amount of heat balanced with sweetness, your customers will love sipping on this delightful creation. Directions: Pour the schnapps and liqueur into a shaker over ice; shake until cold; serve in a low ball whiskey glass. 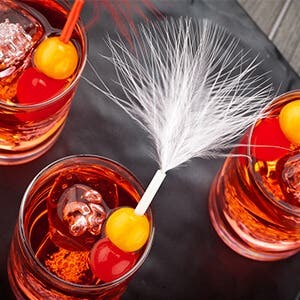 BONUS: Add cherries on a beautiful fuzzy feather skewer and serve on the glass. Your customers will love the hint to the name French Tickler. You can find the skewer here. Another warm cocktail everyone will love. However, this one plays on a southern tradition: sweet iced tea. This drink is a perfect balance between sweet and spicy, perfect for sipping by a fire. Directions: Pour over ice, mix, and drink. Serve in a tall drinking glass. BONUS: Add some contrast by skewering maraschino cherries and serving them on top. You don’t have to use another boring pick, add some pizzazz by using something stunning like this pinecone skewer! Directions: Puree blackberries and sugar together, then continue to stir until the sugar is dissolved. Strain the puree to remove all seeds. Add puree to a glass carafe along with the gin and lime juice. Stir and enjoy by topping each glass off with club soda. 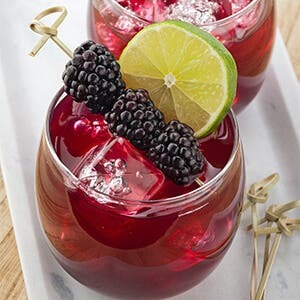 BONUS: Garnish these delicious drinks with a beautiful knotted skewer showcasing fresh blackberries along with a lime slice. Find them here. Directions: Combine ingredients in a cocktail shaker with ice. Strain into a martini glass and add a squeeze of lime juice. 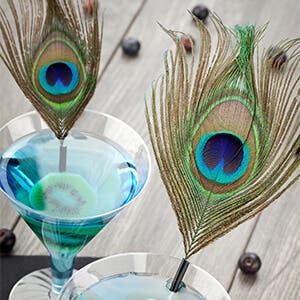 BONUS: Complement the green color of this drink by adding a beautiful peacock feather skewers. Showcase these lovely skewers with cranberries and blueberries to bring the cocktail together. Create your account to see more creative cocktails and to be the first to receive the latest Coupons and Deals. Click here and create your account!